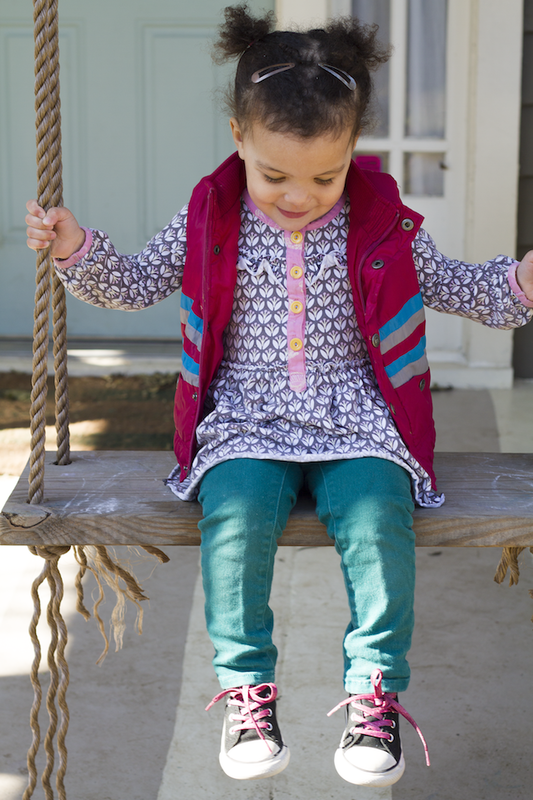 Black and White and Loved All Over: Livvy Lara Turns Two. Tomorrow this angel turns two. It was just yesterday that I was throwing up in my hair and giving birth to her. But anyway, here I am and here she is, in all her toddling, babbling new-two-ness. 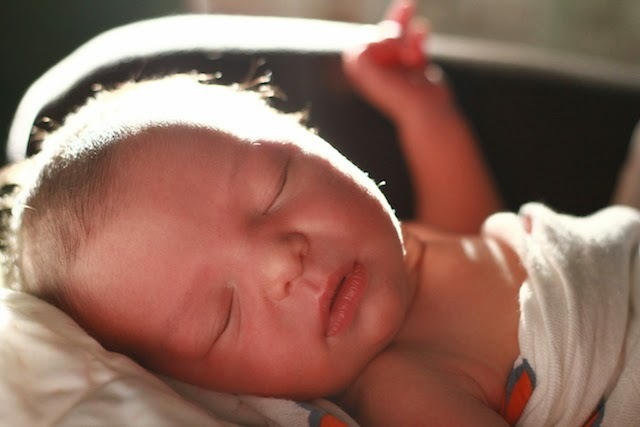 Speaking of Livvy's birth, and of our first few days with her, there's a memory that returns to me: While we were in the hospital after her birth, no one brought or sent flowers. After we had Tessa, there were at least six vases to load into the car when we left the hospital. I remember worrying they'd tip over on that first already-precarious ride home with my new baby. Of course, I worried about everything then. After we got home with Livvy, I confided in my mom that the fact of it--petty or not--made me sad. The second-baby effect, I guessed. Mom was over with roses before I could think another thought about it. 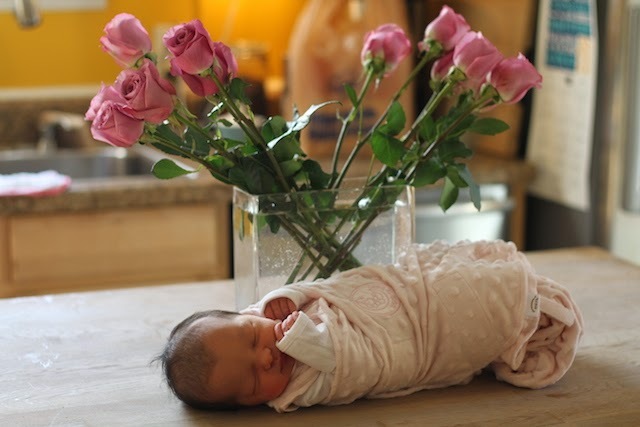 There are pictures of three-day-old Livvy laid across our kitchen island with a swarm of roses behind her. To me, those photos are emblematic of how those of us who love her have always endeavored to make her understand how loved and how worthy she is. Don't leave her alone with a chapstick. She will eat it. She has started throwing tantrums. About ridiculous things only. She goes to a Mother's Day Out program four days a week--the same one Tessa goes to. Tessa will be in kindergarten next year so I relish their short-lived togetherness, my knowing that they are safe in one place. 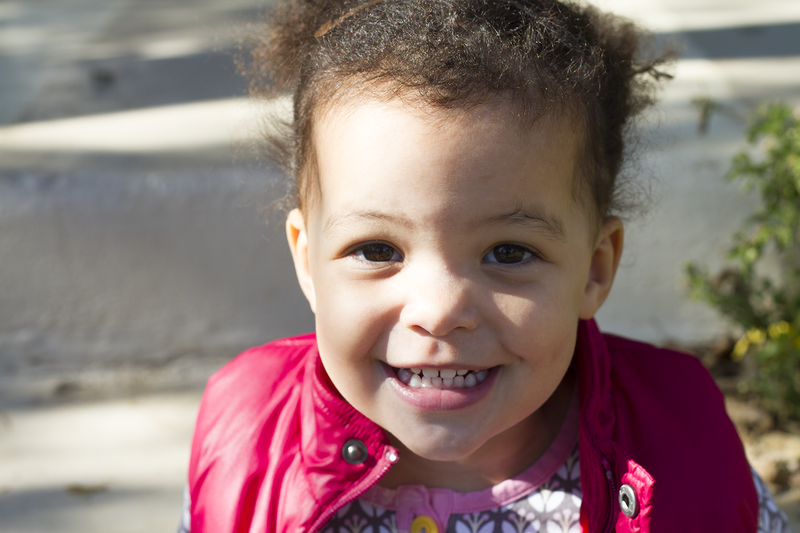 She has started speaking in short sentences, stringing new words together every day. Words that reveal her personality in the most exciting way. (Spoiler alert for the big reveal of her personality .... She's the absolute best.) 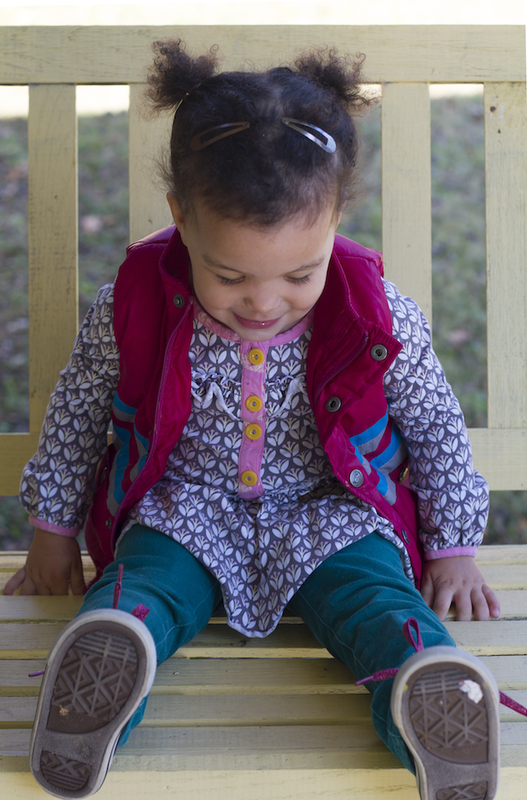 But she still talks in full-on "baby talk," which I would prefer her never to outgrow. 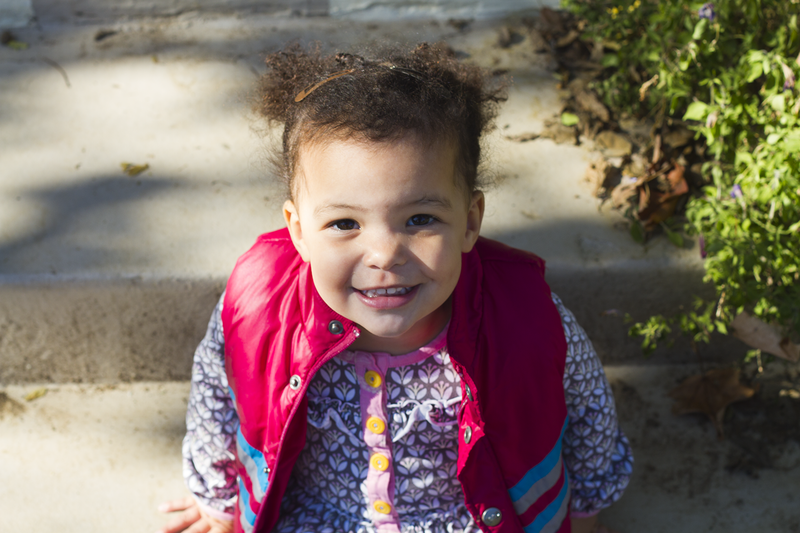 For Livvy, there is no such thing as the letter "L." Ask her her name: She is "Ivvy," and she "uffs" you. Ask her how old she'll be on her birthday, she'll tell you "two" but hold up four fingers. Her hair is now long enough for stubby powder-puff pigtails, which she wears so well. See photos throughout this post. I still carry her around on my hip as much as I can, even though my arms ache sometimes. I love the feel of her weight and her warmth and the way her head tucks toward me to rest against my shoulder blade. I love the velvet of her forehead on my cheek. Even though this post is fragmented because it's at the end of my work day and it's her birthday tomorrow and Thanksgiving the day after that, the most important thing to know about Livvy, if you've made it this far, is that she's a mesmerizing spirit with a sweetness and tenderness that runs deep. All babies are. This one speaks straight to my heart, and my heart is better for it. I will spend the rest of my life bringing Livvy flowers. Garlic knots (and all the marinara) at Five Points Pizza. Baby bottles filled to the top with milk. Electric hand-dryers. Thus, public bathrooms in general. Most Halloween costumes and decorations. The suggestion that she should start pottytraining. The suggestion that she is too old for a bottle. Anything to drink out of other than a bottle. The way her breath smells. The shape of her teeth. Ah, hell, let me just cut to the chase: Every single thing. Your excellent and also care about gucci replica even though burning can be excessive regarding hand mirror impression duplicate bags, as opposed to quality duplicate totes. Due to larger product and also manual work fee; the price tag on hand mirror impression duplicate luggage are generally better as opposed to quality duplicate prada replica. On the other hand, your hand mirror impression good quality can be every single worthy of and also can be exhibit lessly managed by simply girls during the entire earth. Obtaining lovely sight along with exquisite skin color has been your wish to numerous women along with adult men lunchmoney. On the other hand, a close look handbag as well as darker arenas throughout the sight could in some manner lessen the beauty in the eyesight. A lot of experience devastated whenever that they investigate the hand mirror and pay attention to your unappealing arenas all-around his or her eyesight. Since eyesight luggage will certainly make one particular search thirty as well as twenty five several years elderly. The good news is, you'll find approaches relating to tips on how to eradicate eyesight luggage effortlessly perhaps with no planning within the cutlery. If you need to search very good along with experience very good so you desire to remove those people unappealing arenas inside parts all-around your current sight, here are a couple guidelines. Determine what Will cause The design Involving Eyesight hermes replica. Figuring out the number of reasons behind darker eyesight arenas adjoining your sight can assist anyone ascertain the top strategy to your complaint. As outlined by analysis, eyesight luggage are generally a result of numerous components. By far the most widespread hermes replica inside growth involving darker arenas can be substance storage. System body fluids could work out instantaneously from the skin color all-around your current sight. So cute! I like this picture.... Thanks for share.